Alleyways like this in the mangrove forest in Bonaire are man-made, not natural. 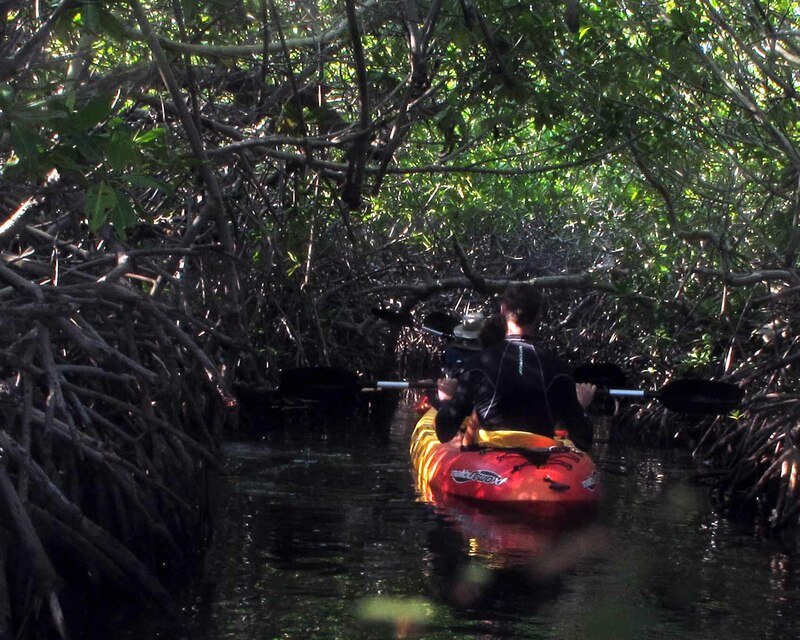 THREE THINGS TO KNOW ABOUT MANGROVE FORESTS: 1) They aren’t swamps. They grow in shallow ocean waters along tropical coasts, surviving tidal fluctuations and thriving on the edge between land and sea. 2) Mangrove trees generate the freshwater they need for survival by using a variety of mechanisms to filter the salt out of the ocean water. 3) They’re essential parts of reef systems, key to the reef life. Above water, the trees are home to a broad range of birds – pelicans, boobies, egrets, herons, spoonbills, among them – that nest in their upper canopies. Ants, spiders, lizards, scorpions, snakes, mangrove tree crabs and other animals fill out the mangrove above-water community. In the still, sheltered waters below, the dense tangles of mangrove roots are home to oysters, crabs, shrimps, sponges and other creatures. And fishes. 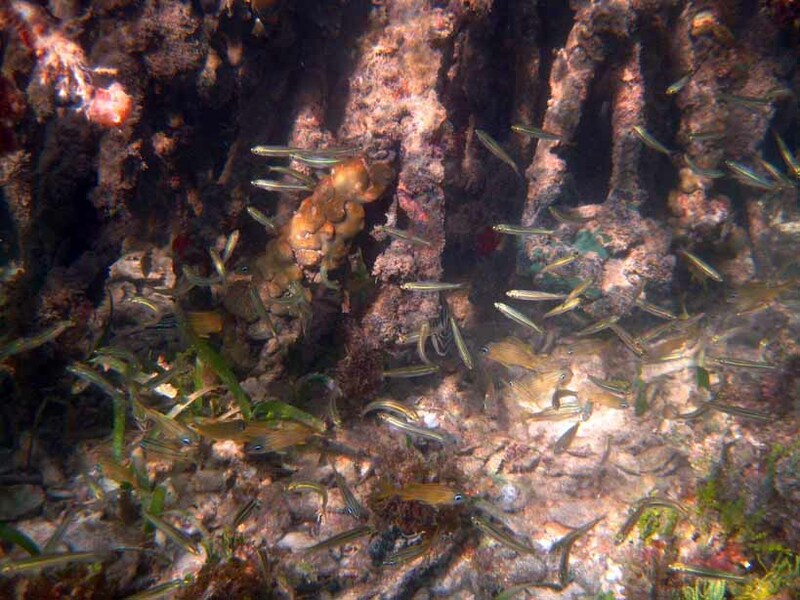 Myriads of juvenile fishes – parrotfishes, barracudas, snappers, grunts, jacks, schoolmasters, among others – hide out and mature in them before returning to the open water reefs. Studies in south Florida found that 75 percent of game fishes and 90 percent of commercial fish species spend at least parts of their lives in mangrove settings. 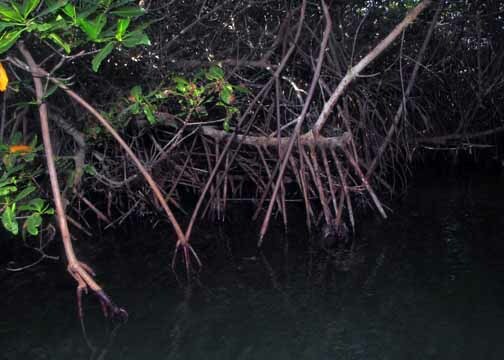 Red mangrove roots anchor the forest – and help protect the dry land further inland. Mangrove forests stabilize shorelines, reduce erosion and buffer coastlines against storms. In many ways, they play the same role as salt marsh meadows in non-tropical regions. As the tides come in, phytoplankton is washed in, supporting plankton feeders. As they go out, detritus – decomposed leaf litter – is washed out into the adjoining waters to provide nutrients for marine life outside the mangrove forests. There are more than 80 species of mangrove trees worldwide. Some cope with significant submersion of their roots each day in salt water, alternated with exposure to the open air. Some flourish in high salinity, others do better close to the less-salty waters of river mouths or on higher ground that is subjected only to shallow flooding at high tide. 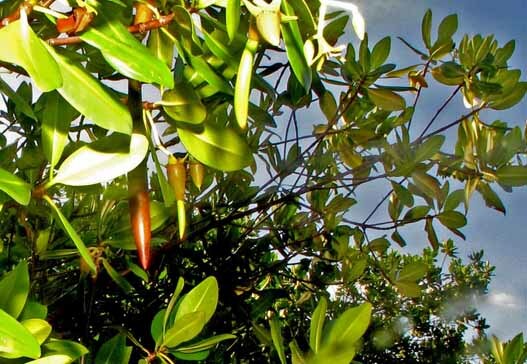 Some types grow on dry land, with no aerial roots but are still part of mangrove systems. Mangroves are found on two-thirds of tropical coastlines around the world, mostly within 30 degrees of the Equator. They range from the east coast of Florida south to Argentina, on both coasts of Africa, in India, southeast Asia and Australia. More than a quarter of the world’s mangrove trees live in Indonesia. That said, there isn’t a mangrove “family” – mangrove species are found in more than 20 families of plants, from holly to legumes. They may range in size from low shrub-like specimens to high timber. The term mangrove itself is used loosely, sometimes describing species specifically in the genus Rhizophora, sometimes all the trees in a mangrove forest and generally any tree that grows in salty water and filters the salt out. Generally, a mangrove forest consists of only a few species. In Florida and Bonaire and (presumably) throughout the Caribbean, three species predominate – red mangroves (R. mangle), black mangroves (Avicennia germinans) and white mangroves (Laguncularia racemose). Each illustrates diverse survival strategies to deal with salinity and respiration needs. Probably the most recognized as “trees on stilts,” red mangroves are the front line species in most mangrove forests. They live along the edge of the shoreline, subjected daily to substantial tidal saltwater immersion, suspended above the waters by their dense tangles of prop roots that stabilize and strengthen the trees. The roots drop from the trunk and branches to anchor the trees in the soft sediment below. With less flooding to deal with, black mangroves. Photo: Cody Hinchliff, 2004, via Wikimedia Commons. 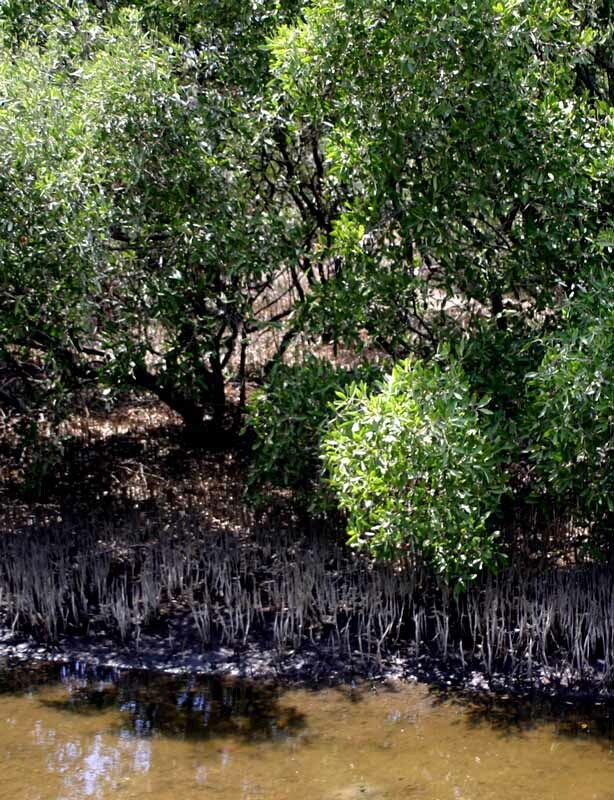 On higher elevations, subject only to high-tide shallow flooding, black mangroves have horizontal roots with pencil-like projections called pneumatophores. Growing at even higher elevations, white mangroves have no visible aerial roots and develop pneumatophore-like structures only when in oxygen-depleted soil or when in an environment subjected to extended immersion. Salt excluders like red mangroves utilize membranes in their roots to prevent most salt from entering them at all. They do so with an internal negative pressure system that begins at the leaf surface and extends through the xylem sap to the roots. Salt concentrations in red mangroves are still about 10 times higher than in most plants but only about 1/70 the salinity of surrounding seawater. Salt excreters do take in saltwater but discard the salt through their leaves. Black mangroves (Avicennia germinans) dispose of the salt through glands in their leaves, giving the leaves coverings of dried salt crystals (and a salty taste, if you should be so-inclined to sample them). White mangroves (Laguncularia racemose) concentrate salt in older leaves and bark, shedding them as they age. 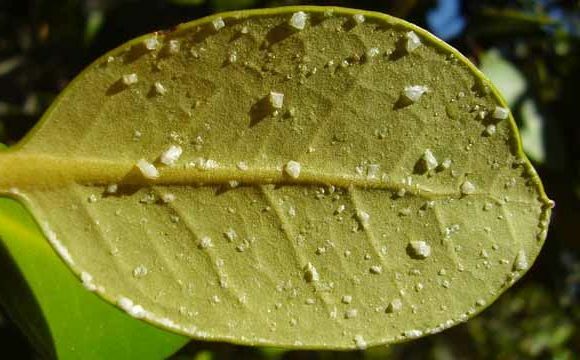 Salt Crystals on the leaf of a gray mangrove, a species found in Australia. Photo: Wikimedia Commons. The ability to thrive in a saline environment is both a badge of hardiness and a benefit. High salinity limits competition from other species, giving mangroves a niche for survival. Alternatively, while some mangroves can survive in fresh water, they can’t compete with other tree species for space in those environments. Mangroves obtain oxygen through their root systems via lenticels, tiny breathing holes that cover the bark. During prop roots’ periods of submersion, surface tension keeps water out. Black mangroves, with less immersion and long, horizontal roots, develop spongy snorkel-like projections called pneumatophores that extend upward to access oxygen, taking it in though lenticels. Occupying even higher, drier settings, white mangroves lack both aerial roots and pneumatophores, although in oxygen-deprived soil they may develop something similar, peg roots. In their unique watery environment, mangroves have developed singular mechanisms for reproduction. Their seeds actually germinate while still on the tree, growing in pods that float once there are dropped. They may take root in the mud nearby, or drift until they find spots to take root. They quickly establish themselves in tidal mud flats and grow as much as two feet in the first year. ….can float until the take root in a mud flat, creating a new area of forest, here at Lac Bay on Bonaire.